Children 12 years and under--no charge. Boat and Motor, 40 h.p. gas included $149.00 daily, C/W Minnow Bucket, Cushions, Paddles and Dip Net. Complete guided package featuring a day's fishing in our 19.5 ft.
Roughneck runabout equipped with 175 h.p. motor, swivel chairs and carpeted floor. 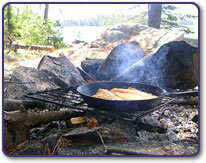 Package includes shore lunch and live bait. All rates quoted in Canadian funds. We allow best exchange rate for U.S. dollars. Taxes are not included. We have recently modernized our fleet of boats. They are 161/2 ft. aluminum boats with 40 h.p. motors and electric start. Boats are equipped with swivel backrest seats and carpeted floorboards. For a problem free trip try renting a boat and motor from us. Good guides are available, let us know in advance. 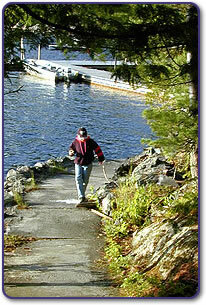 All fishing and hunting licences, as well as outdoor cards and permits, are available in our store. We appreciate you buying your licence from us. 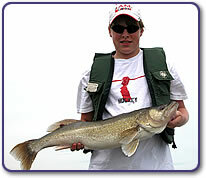 limit of 1 per day minimum 54" on Lake of the Woods and Kakagi Lake. Some smaller lakes, 40 inches--2 in possession. non-residents, 2 per day/4 in possession. 4 in possession, none greater than 29.5". Conservation licences are available for smaller limits at a reduced price. These limits were in effect at date of printing. Note: Changes may occur.